Let's End the Year with a Bang! 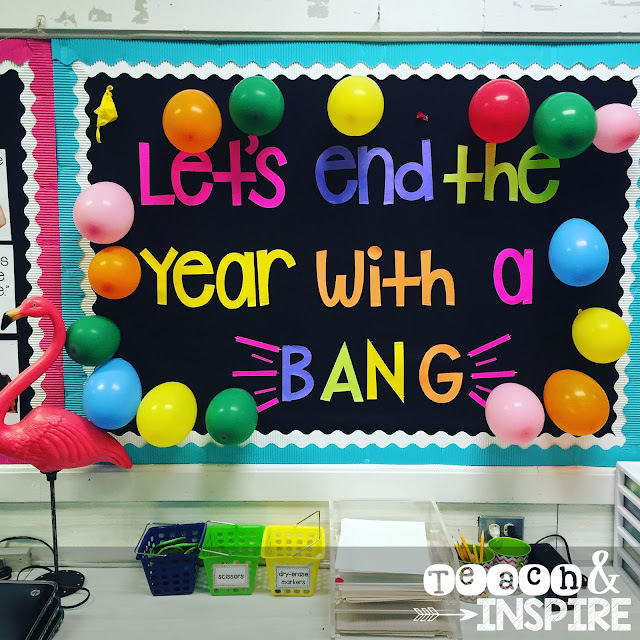 I saw this adorable end of the year bulletin board on miss5th's instagram page and HAD to recreate it in my classroom! I blew up 18 balloons, one for each student in my class. In each balloon was a students name. Every morning we pop a balloon and that student is the VIP for the day! The VIP wears a special name tag that lights up, and gets to sit at the VIP table with a friend. They also get "special" jobs like filing my papers ;). If you have less days of school, than students in your class, you could put special fun activities they can do each day in each ballon instead! I made the letters using my Silhouette Cameo. I used Kimberly Geswein's Shake if Off Chunky font and made the letters 6" tall. I will be updating this post with my special VIP table this weekend! Stay tuned!